ATJ's Home Improvement | News and Alerts | Does the Law Require Chicago Residents to Remove Snow from Sidewalks? 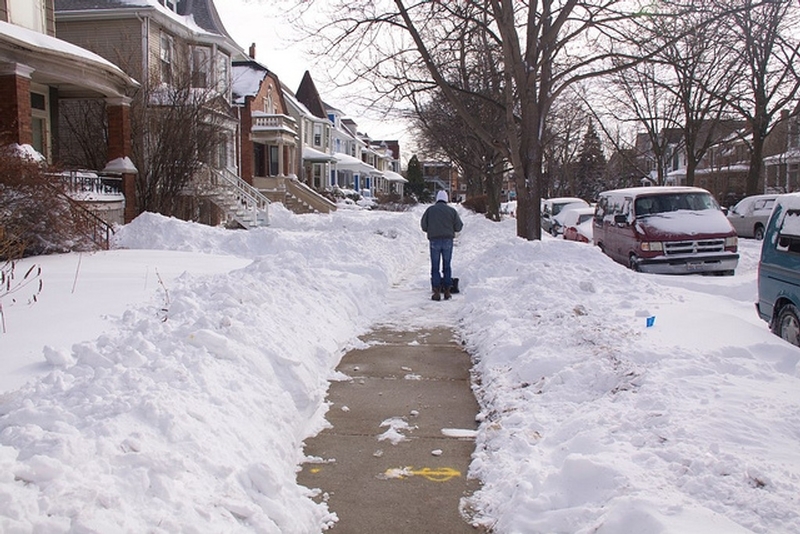 Does the Law Require Chicago Residents to Remove Snow from Sidewalks? Winter brings a lot of fun for kids and adults alike, the only difference is that adults have some serious responsibilities as soon as the snow hits the ground. While some winters bring a lot more white fluffy stuff than others, an average total snowfall in Chicago is 36.7 inches. As we’re fielding first quote requests for snow removal services (yes, some homeowner associations and even individual homeowners start planning early) we’re also getting the usual questions about homeowners’ responsibilities and liabilities. While we’re happy to answer your questions, please keep in mind that our knowledge is based on our experience and information available to everyone online. By no means should this blog post be considered a legal advice. If in doubt (especially if you’re injured) pleased contact an attorney. The most snow removal related question we get is usually this: “Do I have to shovel snow from my sidewalk?” The answer depends on where you live and who you are (whether you’re an individual or a business owner). Generally in Illinois, there is no obligation on the part of a property owner to remove snow and ice… unless a local municipality imposes such an obligation. Chicago has such laws, so does Evanston, Lombard and some other municipalities. Every owner, lessee, tenant, occupant or other person having charge of any building or lot of ground in the city abutting upon any public way or public place shall remove the snow and ice from the sidewalk in front of such building or lot of ground. If the sidewalk is of greater width than five feet, it shall not be necessary for such person to remove snow and ice from the same for a space wider than five feet. In case the snow and ice on the sidewalk shall be frozen so hard that it cannot be removed without injury to the pavement, the person having charge of any building or lot of ground as aforesaid shall, within the time specified, cause the sidewalk abutting on the said premises to be strewn with ashes, sand, sawdust, or some similar suitable material, and shall, as soon thereafter as the weather shall permit, thoroughly clean said sidewalk. The snow which falls or accumulates during the day (excepting Sundays) before four p.m. shall be removed within three hours after the same has fallen or accumulated. The snow which falls or accumulates on Sunday or after four p.m. While the ordinance does not require snow removal from public sidewalks abutting residential properties, the same hazards exist. In addition, the State of Illinois passed the Illinois Snow and Ice Removal Act (745 ILCS 75) which encourages residents to shovel snow even if their municipality doesn’t explicitly require it. This law provides a liability shield to any party who removes or attempts to remove snow or ice from the sidewalks of a residential (but not commercial) property from liability for personal injuries caused by snowy or icy conditions unless that person’s acts were willful or wanton. Therefore, you don’t get a free pass to blow snow wherever you want, but most snow and ice removal done in a reasonable manner will be immune from tort liability. When it comes to landlords and tenants, there’s some gray area, although the law does clarify who’s responsible to a certain extent. It says any person “having charge of any building or lot…” is responsible of clearing snow. So, if the lease is silent, the owner has charge of the building. If a tenant, however, has the responsibility for a building, the tenant may be the liable party (although an argument may still be made that the landlord/building owner remains responsible). The Chicago law sets time limits for removal and guidelines for what kind and amount of removal is appropriate. Note however that the law applies to sidewalks. What about stoops and walkways? There is caselaw that provides that sidewalk under the Illinois statute means stoop and areas leading to the sidewalk, but, as with all things legal, this is highly fact specific and requires an analysis of the given situation. It also has a video that is trying to appeal to our neighborly feelings, as well as remind about fines and a special hotline where residents can report those who don’t feel like shoveling. What happens if you’re a resident of Chicago and don’t clear your sidewalk? Individuals who do not comply can face fines of $50. Businesses that do not comply can face fines up to $1000 per day of violation.